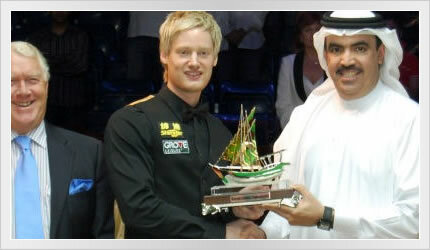 Welcome to neilrobertson.net, the official web site of Australian snooker professional Neil Robertson. 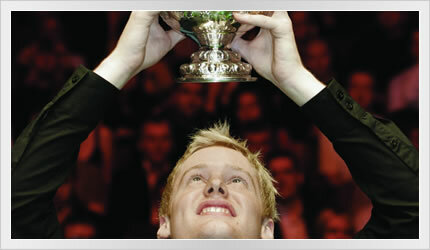 In 2010, Neil collected two professional titles: the World Championship and the World Open. He also joined an elite group of just 8 professional players (at the time) to have held the #1 world ranking, since rankings officially commenced in 1975. 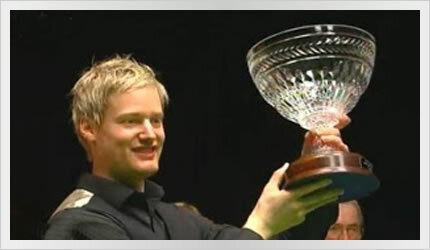 In 2011, Neil added to his trophy cabinet with PTC6, the first professional tournament ever held in Poland, and PTC8 the inaugural Alex Higgins International Trophy held in Ireland. 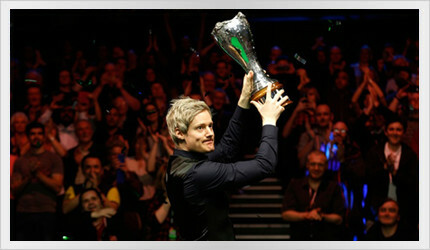 In 2012, Neil claimed his first Masters title in January, becoming just the 11th professional player to have won both the World Championship and The Masters. He was also Runner-Up in the Grand Finals of the Players Tour Championship, claimed the ET2 title in Gdynia, Poland, and was Runner-Up in the inaugural International Championship in Chengdu, China. In 2013, Neil was the Runner-Up at The Masters, Runner-Up at the PTC Grand Final, and won the China Open and Wuxi Classic. Neil's first ranking victory in China also made him the most successful professional from outside the UK. 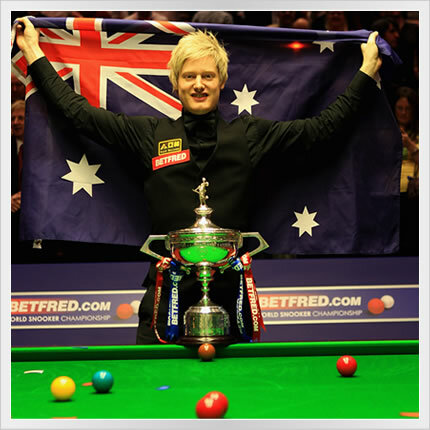 Neil was also Runner-Up in the 3rd Australian Goldfields Open, and won his first UK Championship. In 2014, Neil was the Runner-Up at the China Open, won the Wuxi Classic, and was Runner-Up at the Australian Open. 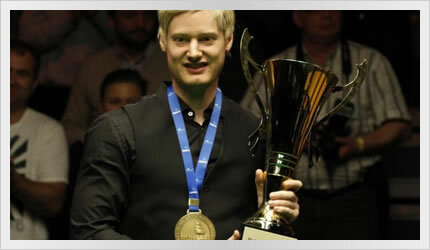 In 2015, Neil was the Runner-Up at The Masters, won the Gdynia Open/ET6, won the Champion of Champions, and won the UK Championship. Neil defeated Graeme Dott 18-13 to claim his first world title, and extend his record to 5 wins from 5 ranking event finals, with 1 victory in each of the last 5 calendar years. 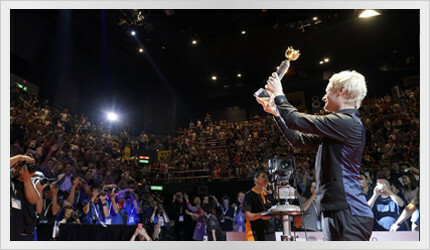 Read about how Australia welcomed home their World Champion. Neil came from 4-8 down to defeat Cao Yupeng 9-8 and claim the Scottish Open title. Neil defeated John Higgins 6-3 to advance to the Final. Neil defeated Xiago Guodong 5-4 to advance to the Semi Finals. Neil defeated Chris Totten 4-0 and David Grace 4-2 to advance to the Quarter Finals. Neil defeated Liam Highfield 4-2 to advance to Round 3. Neil defeated Rod Lawler 4-0 to advance to Round 2. Neil was defeated 6-5 by Mark Joyce. Neil defeated Ken Doherty 6-2 to advance to Round 3. Neil defeated Rod Lawler 6-1 to advance to Round 2. Neil was defeated 4-3 by Robert Milkins. Neil defeated Billy Joe Castle 4-0 to advance to Round 3. Neil defeated Jamie Jones 4-1 to advance to Round 2. Neil was defeated 4-1 by Ronnie O'Sullivan. Neil was defeated 6-2 by Robbie Williams. Neil trailed 0-3, 1-4, and 2-5 before winning the last four frames to defeat Matt Selt 6-5 to advance to Round 3. Neil defeated Gary Wilson 6-2 to advance to Round 2. Neil was defeated 5-3 by Anthony McGill. Neil defeated Jimmy Robertson 4-2 and Aditya Mehta 4-1 to advance to the Quarter Finals. Neil defeated Li Hang 4-3 to advance to Round 3. Neil defeated Billy Joe Castle 4-0 to advance to Round 2. Neil was defeated 5-2 by Chris Totten. Neil was defeated 4-2 by Mark Williams. Neil defeated Peter Ebdon 4-0 to advance to Round 3. Neil defeated Fang Xiongman 4-0 with breaks of 76, 134, 80, and 100, to advance to Round 2. Neil defeated Craig Steadman 6-2 to qualify for the final stages in China in October. Neil was defeated 5-4 by Mark Allen in Round 3. Neil defeated Ben Woollaston 5-4 to advance to Round 3. Neil defeated Noppon Saengkham 5-1 to advance to Round 2. Neil defeated Mark Selby 5-3 in the Quarter Finals, defeated Marco Fu 6-4 in the Semi Finals, and defeated Ronnie O'Sullivan 6-3 in the Final to claim the Hong Kong Masters. Neil and his teammate Kurt Dunham represented Australia in the World Cup, narrowly missing the knock-out stages by finishing third in group C on 12 points. Neil was defeated 4-3 by Lukas Kleckers in Round 1. Neil was defeated 13-11 by Marco Fu. At the end of the first of three sessions Neil and Marco Fu were level at 4-4, and at the end of their second session they were level at 8-8. Neil defeated Noppon Saengkham 10-4 to advance to Round 2. At the end of the first of two sessions Neil leads Noppon Saengkham 8-1. In frame 6 Neil compiled his 500th career century, becoming just the 4th player to achieve this milestone. Neil defeated Barry Hawkins 5-0 in Round 1, but was defeated by Ali Carter 5-3 in the Quarter Finals. Neil defeated Jaspal Bamotra 4-0, Chris Wakelin 4-2, Rhys Clark 4-2, and Jamie Jones 4-0 to reach the Quarter Finals, where he was defeated 4-2 by Ryan Day. Neil was defeated 4-3 by Lee Walker. Neil defeated Jimmy White 4-1 to advance to Round 2. Neil defeated Ronnie O'Sullivan 4-1 to advance to the Quarter Finals, but was defeated 4-2 by Barry Hawkins. Neil defeated Ricky Walden 4-2 to advance to Round 2. Neil was defeated 5-4 by Ben Woollaston. Neil was defeated 6-3 by Ronnie O'Sullivan. Neil defeated Ali Carter 6-3 to advance to the Quarter Finals. Neil defeated Joe Swail 4-2 to advance to Round 4, and was defeated 4-3 by Marco Fu. Neil defeated Gary Wilson 4-2 to advance to Round 3. Neil defeated Thor Chaun Leong 4-1 to advance to Round 2. Neil defeated Christopher Keogan 5-1 to qualify for the final stages in February. Neil defeated Lee Walker 5-2 to advance to Round 2. Neil was defeated 6-3 by Peter Lines. Neil was defeated 4-2 by Stuart Bingham. Neil was defeated 6-5 by Michael Holt. Neil was defeated 6-2 by Joe Perry. Neil defeated Anthony Hamilton 6-4 to advance to Round 3. Neil defeated Oliver Lines 6-0 to advance to Round 2. Neil was defeated 4-3 by Xiao Guodong. Neil defeated Duane Jones 4-1 to advance to Round 3. Neil defeated Hamza Akbar 4-1 to advance to Round 2. Neil was defeated 6-0 by Ronnie O'Sullivan. Neil defeated Anthony McGill 4-2 to advance to the Semi Finals. Neil defeated Rhys Clark 4-1 to advance to the Quarter Finals. Neil defeated Graeme Dott 4-2 to advance to Round 2. Neil defeated Sam Craigie 6-5 to qualify for the final stages in October. Neil defeated Oliver Lines 4-1 to qualify for the final stages in October. Neil defeated Boonyarit Kaettikun 4-1 to advance to Round 2. Neil was defeated 5-2 by Ryan Day. Neil defeated David Gilbert 5-2 to advance to the Semi Finals. Neil defeated Ryan Day 5-1 to advance to the Quarter Finals. Neil defeated Thor Chaun Leong 5-1 to advance to Round 3. Neil defeated Ian Burns 5-2 to advance to Round 2. 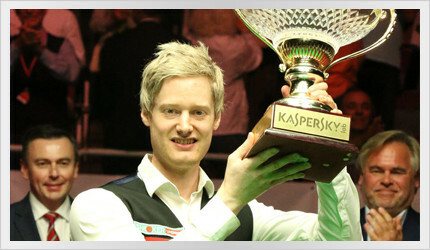 Neil defeated Judd Trump 4-1, Darren Morgan 5-0, and Michael Holt 5-2 to claim the Riga Masters. Neil defeated Stuart Carrington 4-1 and Matthew Stevens 4-1 to advance to the Quarter Finals. Neil defeated Michael Georgiou 4-1 to advance to Round 2. Neil defeated Michael Collumb 4-2 to qualify for the Riga Masters in Latvia. Neil defeated Sydney Wilson 5-4 to qualify for the World Open in Yushan, China. Neil was defeated 10-6 by Michael Holt. Neil was defeated 5-3 by Noppon Saengkham. Neil was defeated 4-3 by Peter Ebdon. Neil finished Runner-Up at the Welsh Open, defeated 9-5 in the final by Ronnie O'Sullivan. Neil defeated Mark Allen 6-4 to advance to the Final. Neil defeated Ding Junhui 5-2 to advance to the Semi Finals. Neil defeated Marco Fu 4-2 to advance to the Quarter Finals. Neil defeated Anthony McGill 4-2 to advance to the Last 16. Neil defeated Stuart Carrington 4-1 to advance to Round 3. Neil defeated Fraser Patrick 4-3 to advance to Round 2. Neil defeated Hossein Vafaei Ayouri 5-3 to qualify for the final stages in March. Neil was defeated 6-5 by Judd Trump. Neil defeated Marco Fu 6-0 to advance to the Quarter Finals. Neil was defeated 5-1 by Ashley Hugill in their Round 1 qualifier. 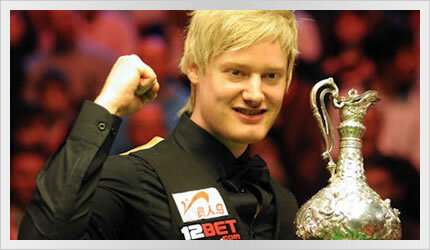 Neil defeated Liang Wenbo 10-5 to claim the UK Championship for the second time. This was the first time two players from outside the UK have contested the final of the UK Championship, and Neil's maximum break in frame six was the first time a 147 break has been compiled in the final of a "Triple Crown" tournament. Neil defeated Mark Selby 6-0 to advance to the Final. Neil defeated John Higgins 6-5 to advance to the Semi Finals. Neil defeated Stephen Maguire 6-1 to advance to the Quarter Finals, with breaks of 126, 101, and 113. Neil defeated Thepchaiya Un-Nooh 6-2 to advance to Round 4. Neil defeated Aditya Mehta 6-2 to advance to Round 3. Neil defeated Alex Taubman 6-3 to advance to Round 2. 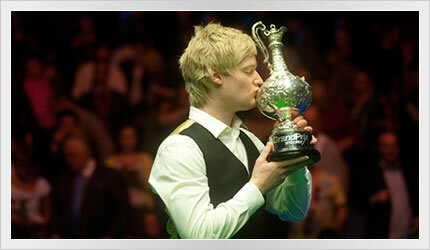 Neil defeated Mark Allen 10-5 to claim the title of Champion of Champions. Neil defeated Joe Perry 6-4 to advance to the Final. Neil defeated Rory McLeod 4-0 and Yan Bingtao 6-3 to advance to the Semi Finals of the Champion of Champions. Neil defeated Graeme Dott 6-1 to advance to the Quarter Finals. Neil defeated Fergal O'Brien 6-3 to advance to the Last 16. Neil defeated Martin O'Donnell 6-2 to advance to Round 2. Neil was defeated 4-3 by James Cahill in Round 1. Neil defeated Kuldesh Johal 6-3 to qualify for the final stages of the International Championship in China. Neil was defeated 5-4 by Jamie Cope. Neil was defeated 5-4 by Matt Selt. At the end of their second session Neil trailed Barry Hawkins 7-8, and in the third session he was defeated 13-12. At the end of their first session Neil trails Barry Hawkins 3-5. Neil defeated Ali Carter 13-5, with a high break of 145, to advance to the Quarter Finals. At the end of their second session, Neil leads Ali Carter 11-5. Neil leads Ali Carter 6-2 at the end of the first of three sessions. Neil defeated Jamie Jones 10-2 to advance to Round 2. At the end of their first session Neil leads Jamie Jones 7-2. Neil was defeated 5-4 by Dechawat Poomjaeng in Round 1. Neil was defeated 4-1 by Mark Davis. Neil defeated Marco Fu 4-3 to advance to Round 2. Neil was defeated 4-3 by Mark Davis. Neil defeated Luca Brecel 4-0 to advance to Round 2. Neil defeated Oliver Lines 4-3, Judd Trump 4-3, and Shaun Murphy 4-2 to reach the Final where he defeated Mark Williams 4-0 to claim the title. Neil defeated Adam Duffy 4-3, Anthony Hamilton 4-0 and Tony Drago 4-0 to advance to the Last 16. Neil was defeated 4-2 by Gary Wilson. Neil defeated Jamie Cope 4-3 to advance to the Last 16. Neil defeated James Cahill 4-0 and David Morris 4-0 to advance to Round 3. Neil defeated Lu Haotian 5-3 to qualify for the China Open in March. Neil was defeated 5-4 by Stephen Maguire. Neil defeated Xiao Guodong 5-0 to advance to the Quarter Finals. Neil defeated Fergal O'Brien 5-0 to advance to Round 2. Neil finished Runner-Up at The Masters, defeated 10-2 by Shaun Murphy. Neil defeated Ronnie O'Sulllivan 6-1 with breaks of 100, 66, 58, and 60 to reach the Final. Neil defeated Ali Carter 6-1 with breaks of 128, 98, 127, and 94 to reach the Semi Finals. Neil defeated Robert Milkins 6-4 with breaks of 60, 77, 95, 117 and 76 to reach the Quarter Finals. Neil defeated Jamie Jones 5-2 to qualify for the final stages of the German Masters. Neil defeated Mitchell Mann 5-4 to advance to Round 2. Neil was defeated 6-5 by Graeme Dott in the Last 16. Neil defeated Peter Ebdon 6-2 to advance to Round 4. Neil defeated Kyren Wilson 6-5 to advance to Round 3. Neil defeated Joe O'Connor 6-0 to advance to Round 2. Neil defeated Liang Wenbo 4-3 to reach the Quarter Finals but was defeated 4-2 by Stephen Maguire. Neil defeated Noppon Saengkham 4-2, Jak Jones 4-0, and Craig Steadman 4-2 to reach the Last 16. Neil was defeated 6-4 by Judd Trump in the Semi Final. Neil defeated Ali Carter 4-0 and Ricky Walden 6-3 to reach the Semi Finals. Neil was defeated 6-5 by Joe Swail in the Last 32. Neil defeated Matt Selt 6-3 to advance to Round 2. Neil defeated Steven Hallworth 4-1 to advance to Round 2, but was defeated 4-1 by Gerard Greene. Neil defeated Alex Borg 6-5 to qualify for the final stages in Chengdu. Neil was defeated 5-4 by Michael White in Round 1. Neil was defeated 4-2 by Dechawat Poomjaeng in the Last 16. Neil defeated Elliot Slessor 4-3, Jimmy Robertson 4-0, and Anthony McGill 4-3 to advance to the Last 16. Neil defeated Ross Muir 4-3 to advance to Round 4 but was defeated 3-4 by Jak Jones. Pro Snooker Blog have published a comprehensive interview with Neil on a wide range of subjects on and off the table: Part 1 and Part 2. 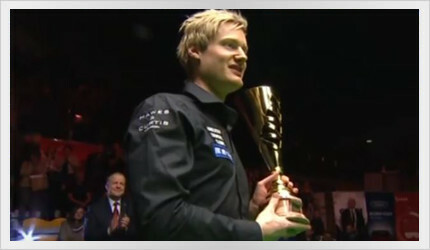 Neil finished Runner-Up, defeated 9-5 by Judd Trump. In reaching the final, Neil accumulated enough ranking points to reach world #1 for the third time. Neil defeated Mark Davis 6-2 to advance to the Final, with breaks of 84, 80, and 100. Neil defeated Robert Milkins 5-2 to advance to the Semi Finals. 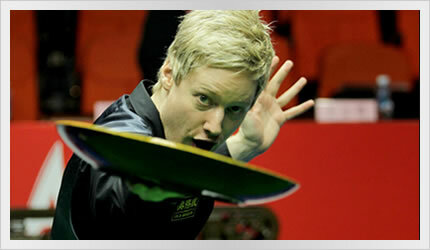 Neil defeated Jamie Jones 5-0 to advance to the Quarter Finals, with breaks of 103, 86, 140, and 80. Neil defeated Andrew Higginson 5-2 to advance to Round 2. 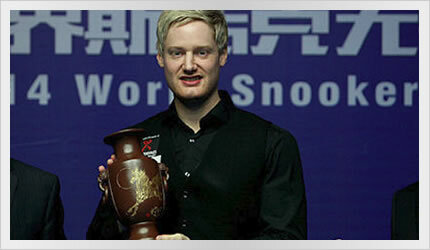 Neil defeated Joe Perry 10-9 to successfully defend his Wuxi Classic title and claim his 10th major ranking title. Neil defeated Barry Hawkins 6-3 to advance to the Final. Neil defeated Shaun Murphy 5-4 to advance to the Semi Finals. Neil defeated Michael Holt 5-1 to advance to the Quarter Finals. Neil defeated Michael Georgiou 5-3 to advance to Round 3. Neil's first round opponent had to withdraw so Neil received a walk-over into Round 2. Neil defeated Steven Hallworth 5-1 to qualify for the Wuxi Classic in June. 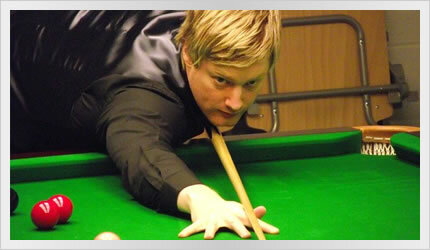 Neil finished his third session against Mark Selby level at 12-12, but in the last session was defeated 15-17. At the end of their second session Neil trails Mark Selby 7-9. At the end of the first of four sessions Neil trails Mark Selby 3-5. Neil defeated Judd Trump 13-11 to advance to the Semi Finals. Neil also compiled a 101 break to complete his remarkable "century of centuries" in a single season. At the end of the first of three sessions Neil trails Judd Trump 2-6. Neil defeated Mark Allen 13-7 to advance to the Quarter Finals. Neil ended the first of three sessions level with Mark Allen at 4-4, and the second session ahead at 9-7. Neil made 2 centuries taking his season tally to 99. Neil defeated Robbie Williams 10-2 to advance to Round 2. Neil made 4 century breaks (132, 103, 140, 102) taking his season tally to 97. 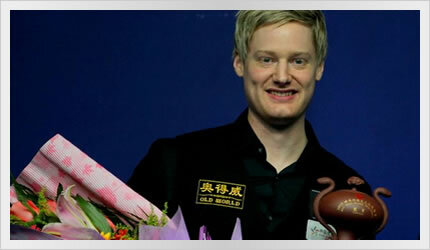 Neil finished Runner-Up in the China Open, defeated 10-5 in the final by Ding Junhui. Neil defeated Ali Carter 6-2 to advance to the Final. Neil defeated Graeme Dott 5-3 to advance to the Semi Finals. Neil defeated Yu Delu 5-4 to advance to the Quarter Finals. Neil defeated Mark Williams 5-4 to advanced to Round 3. Neil defeated Anthony Hamilton 5-4 to advance to Round 2. Neil was defeated 4-2 by Shaun Murphy in Round 1. Neil was defeated 5-4 by Marco Fu in the Last 16. Neil defeated Rory McLeod 5-1 to advance to the Last 16. Neil defeated Jamie Jones 5-1 to advance to Round 2. Neil was defeated 4-3 by Mark Williams in the Last 32. Neil defeated Rory McLeod 4-0 to advance to Round 3. Neil defeated Lu Haotian 4-1 to advance to Round 2. Neil defeated Li Yan 5-3 to advance to the finals in Beijing, March 31 - April 6. Neil finished last after the round robin stages, with 1 win and 5 losses, and is eliminated from the Championship League. Neil defeated Adam Stefanow 4-1 to advance to the Last 64, where he was defeated 4-3 by Alan McManus. Neil was defeated 5-1 by Tian Pengfei. Neil defeated Liu Chuang 5-1 to advance to Round 2. Neil finished 2nd after the round robin stages, with 3 wins and 3 losses, eventually losing to Stephen Macguire 3-0 in the Final. Neil now advances to Group 5. Neil finished 2nd after the round robin stages, with 4 wins and 2 losses, eventually losing to Ryan Day 3-2 in the Semi Final. Neil now advances to Group 4. Neil was defeated 6-2 by Stephen Macguire in their Quarter Final. Neil defeated Mark Allen 6-5 to advance to the Quarter Finals. Neil finished 3rd in his group on 4 points, with 4 wins and 2 losses, eventually defeated by Joe Perry 3-2 in their Semi Final. Neil now advances to Group 3. Neil defeated Alexander Ursenbacher 5-0 to qualify for the World Open in March. Neil defeated Ian Burns 5-2 to qualify for the German Masters in January. 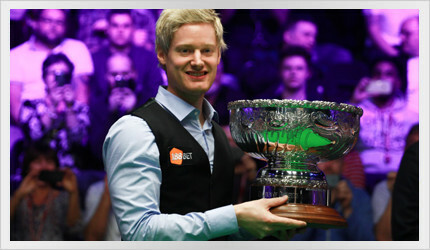 Neil defeated Mark Selby 10-7 to claim his first UK Championship. 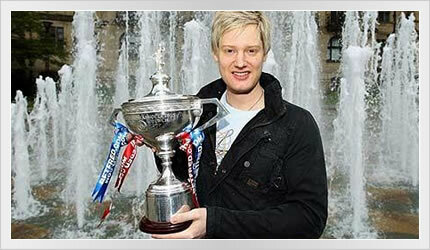 Neil becomes just one of eight players and the only overseas players to claim snooker's Triple Crown of the Masters, World title, and UK Championship. Neil defeated Stuart Bingham 9-8 to advance to the Final. Neil defeated Stephen Maguire 6-2 to advance to the Semi Finals. Neil defeated Joe Perry 6-1 to advance to the Quarter Finals. Neil defeated Li Hang 6-3 to advance to Round 4. Neil defeated Robbie Williams 6-1 to advance to Round 3. Neil defeated Dylan Mitchell 6-0 to advance to Round 2. Neil was defeated 6-5 by Ronnie O'Sullivan in their Semi Final. Neil defeated Martin Gould 4-3 and Ali Carter 6-5 to advance to the Semi Finals. Neil defeated Kurt Maflin 4-1 to reach the Quarter Finals where he was defeated 4-2 by Mark Allen. Neil defeated Fraser Patrick 4-0, Marco Fu 4-3, and Ronnie O'Sullivan 4-2 to advance to the Last 16. Neil was defeated 6-5 by Peter Ebdon in the Last 16. Neil defeated Thepchaiya Un-Nooh 6-1 to advance to the Last 16. Neil defeated Alex Davies 6-4 to advance to Round 2. Neil was defeated 4-2 by Ding Junhui in the Quarter Finals. Neil defeated Liang Wenbo 4-2 to advance to the Quarter Finals. Neil defeated Rod Lawler 4-2 to advance to Round 3. Neil defeated Noppon Saengkham 4-1 to advance to Round 2, with 3 more century breaks (103, 103, 103). Neil defeated Ahmed Saif 4-0 with 4 centuries in a row (108, 100, 105, 100), then defeated Robert Milkins 4-1 with 2 further centuries (104, 103), but was defeated in the Last 32 by Stuart Bingham 4-2. Neil defeated Li Hang 6-2 to qualify for the International Championship. Neil was defeated 5-2 by Ding Junhui. Neil defeated Mark King 5-3 to advance to the Quarter Finals. Neil defeated Wang Yuchen 5-1 to advance to Round 2. Neil was defeated in the final by Mark Davis 7-2. Neil finished Runner-Up, defeated 8-4 by Mark Davis. Neil defeated Shaun Murphy 6-3 and Stuart Bingham 7-4 to reach the Final of the 6 Red World Championship. Neil defeated Issara Kaichawong 6-5 and Judd Trump 6-5 to advance to the Quarter Finals. Neil was defeated 4-0 by Thepchaiya Un-Nooh. Neil was defeated 4-3 by Liang Wenbo in Round 1. Neil defeated Robin Hull 4-3 to advance to the final stages in Delhi in October. Neil finished as Runner-Up at the Australian Goldfields Open, defeated 9-6 by Marco Fu. Neil defeated Mark Selby 6-3 to advance to the Final. Neil defeated Joe Perry 5-2 to advance to the Semi Finals. Neil defeated Marcus Campbell 5-1 to advance to the Last 16. Neil defeated John Higgins 10-7 to claim his second ranking title in China. Neil defeated Robert Milkins 6-2 to advance to the Final. Neil defeated Cao Yupeng 5-4 to advance to the Semi Finals. Neil defeated Mark King 5-0 to advance to the Quarter Finals. Neil defeated Martin Gould 5-2 to advance to the Last 16. Neil defeated Zhu Yinghui 5-2 to advance to the Last 32. Neil defeated Anthony Hamilton 4-1, Jimmy Robertson 4-2, and Barry Hawkins 4-3 to reach the Final of the Bulgarian Open, but was defeated in the Final 4-1 by John Higgins. Neil's run to the final gave him enough world ranking points to reclaim the #1 spot. Neil defeated Iveilo Pekov 4-0, Kurt Maflin 4-2, and Mike Dunn 4-1 to advance to the Last 16. Neil defeated Mohamed Khairy 5-0 to qualify for the Wuxi Classic. In the second frame he compiled his second professional career maximum (147) break. At the sport's annual awards ceremony in London, Neil and 6 other former world champions were inducted into the Snooker Hall of Fame (Terry Griffiths, Joe Johnson, Ken Doherty, Peter Ebdon, Shaun Murphy, Graeme Dott). Neil was defeated 10-8 by Robert Milkins. At the end of their first session Neil leads Robert Milkins 5-4. Neil defeated Mark Selby 10-6 to claim his first ranking event in China. Neil defeated Stephen Maguire 6-5 to advance to the Final. Neil defeated Marcus Campbell 5-2 to advance to the Semi Finals. Neil defeated Mark Allen 5-1 to advance to the Quarter Finals. Neil defeated Jimmy Robertson 5-0 to advance to the Last 16. Neil defeated Tom Ford 4-3 to reach the Final, but was defeated 4-3 by Ding Junhui. Neil defeated Xia Guodong 4-1 to advance to the Semi Finals. Neil defeated Barry Hawkins 4-1 to advance to the Quarter Finals. Neil defeated Jamie Burnett 4-2 to advance to the Last 16. Neil was defeated 6-5 by Matthew Stevens. Neil defeated Mark Selby 5-3 to advance to the Semi Finals. Neil defeated Graeme Dott 5-0 to advance to the Quarter Finals. Neil defeated Dominic Dale 5-2 to advance to the Last 16. Neil defeated Duane Jones 4-3 in Qualifying Round 2, and defeated Ian Burns 4-1 in Round 1, before losing to Stuart Bingham 4-3 in Round 2. Neil was defeated by Ali Carter 6-2. Neil defeated Michael Wasley 5-1, and Andrew Higginson 5-1 to advance to the Quarter Finals. Neil defeated Daniel Wells 5-0 to advance to the Last 32. Neil was defeated 10-6 by Mark Selby, to finish Runner-Up in his first Masters defence. Neil defeated Shaun Murphy 6-2 to advance to the Final. Neil defeated Mark Allen 6-5 to advance to the Semi Finals. Neil defeated Ding Junhui 6-5 to advance to the Quarter Finals. Neil was defeated by Ali Carter 3-2, Martin Gould 3-1, and Mark Davis 3-1 before losing 3-1 to Martin Gould in the Semi Final of Group 2. Neil defeated Stephen Maguire 3-1, Stuart Bingham 3-0, and Judd Trump 3-1 to head into the second day of Group 2 in equal first with Ali Carter on the Round-Robin ladder. Neil was defeated 4-3 by Kurt Maflin.